Comic book movies often hinge on a brilliant villain creating a device that could kill millions, but Iron Man’s filthy-rich genius Tony Stark flips that script and uses potential doomsday weapons for good. Of course, reality isn’t a comic book movie, and if someone tried to develop Iron Man technology in real life, the results could be terrifying, even catastrophic. And that is just what Patrick Priebe, who runs the ominously tiled website Laser Gadgets, has done. 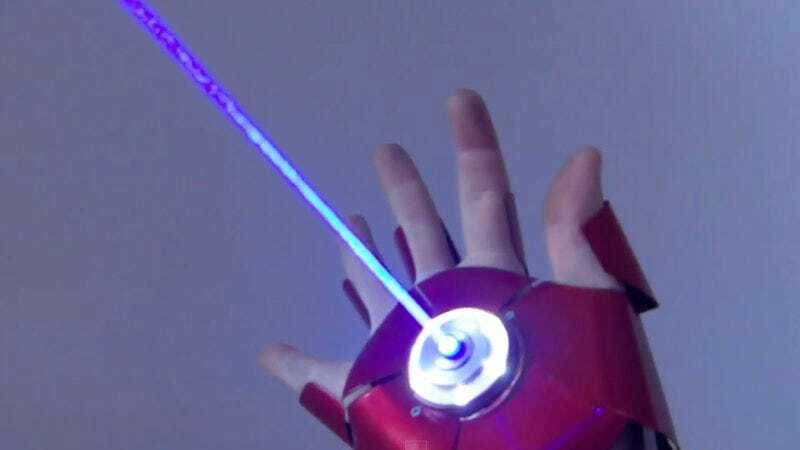 In honor of Avengers: Age of Ultron, Priebe has built a working Iron Man glove, complete with red and blue lasers, that can be seen popping balloons, burning wood, and charring oranges. Throw in the dude’s German accent, and we might just have the birth of a supervillain caught on YouTube. So while we wait for our military to descend on Priebe’s lab and stop him from destroying life as we know it, be comforted in the fact that the glove’s metal ejector switch seems only able to launch shrapnel at minimal speeds, not dangerous enough to do real damage. Yet.